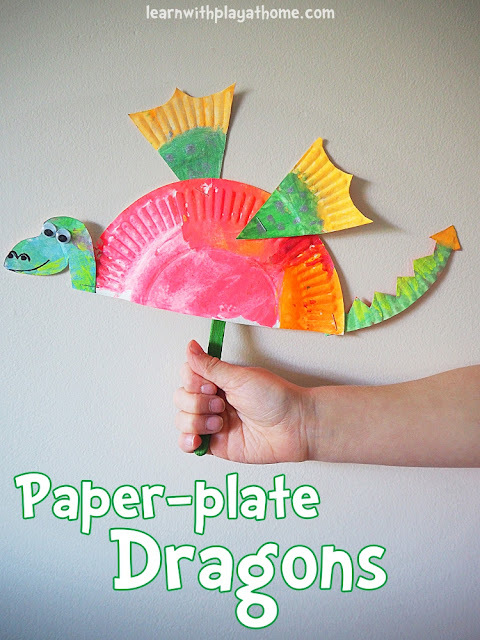 Create a magical dragon from one paper plate. Inspired by the brand new series, Dragons: Race to the Edge, by the creators of "How to Train Your Dragon," due to be released on Netflix soon, the kids and I created our very own dragon puppets! Using a single paper plate as the base, decorate your dragon with paper collage, paint, fabric scraps or whatever takes your fancy. Step 1: Cut your paper plate as shown above. First cut it in half. Cut one half in half again (to make 2 quarters) and then cut one of the quarters in half again (to make 2 eighths). Step 2: Cut the rim of the plate off the quarter plate piece. Step 3: Cut little triangles off the plate rim piece to make the tail and draw a dragon head on the remaining piece. Step 4: Cut out your dragon head and give some shape to the two other small plate pieces (the eighths) for the wings. Your dragon is now ready to decorate and ensemble. Step 5: (optional) Decorate! We decorated our dragons with my favourite fluro tempera paint disks and some metallic easy wash paint. Step 6: When dry and ready, staple (or stick) the pieces of your dragon together. For finishing touches you can go over the dragon's face with a black marker and add googly-eyes. (Everything is adorable with googly-eyes). We also added craft sticks to the bottom to turn ours into puppets. Now you're ready to play! Crafts can be a great extension of an activity to encourage interest and understanding in a topic whilst allowing for creativity and other practical motor skills. We use things like puppets for role-play and find they are wonderful for working on language and other speech skills.